Downtown Cordell, Oklahoma. West of intersection of Highway 158 and U.S. 183. 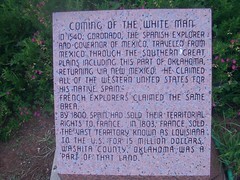 In 1540, Coronado, the spanish explorer and governor of Mexito, traveled from Mexico through the souther great plains including this part of Oklahoma, returning via New Mexico. He claimed all of the western United States for his native Spain. French explorers claimed the same area. By 1800 Spain had sold their territoral rights to France. The Vast Territory known as Louisiana to the U.S. for 15 million dollars. Washita County, Oklahoma was part of that land. 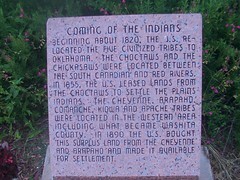 Beginnin about 1820, the U.S. relocated the five civilized tribes to Oklahoma. The Choctaws and the Chickasaws were located between the South Canadian and Red rivers. In 1855, the U.S. leased lands from the Choctaws to settle the plains Indians. The Cheyenne, Arapaho, Comanche, Kiowa and Apache tribes were located in the western area including what became Washita County. In 1890 the U.S. bought this surplus land from the Cheyenne and Arapaho and made it available for settlement.